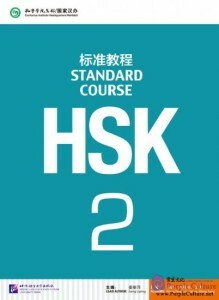 HSK Standard Course 2 Textbook includes 15 lessons and covers 300 words (of Levels 1 and 2) and language points required by the HSK Level 2 test. Upon finishing this book, students will be able to “understand and use a few simple Chinese words and sentences to meet their specific needs in communication and to prepare themselves for further learning”. The book is illustrated with photos match the style of the test and is printed in full color. An audio CD comes with the book.